When it comes to describing the Manitou Incline, there’s no mincing words. It’s relentlessly steep and a ferocious challenge for anyone who tries to hike or run it. Situated near the base of Pikes Peak in Manitou Springs, Colo., the Manitou Incline rises more than 2,000 vertical feet in less than a mile. 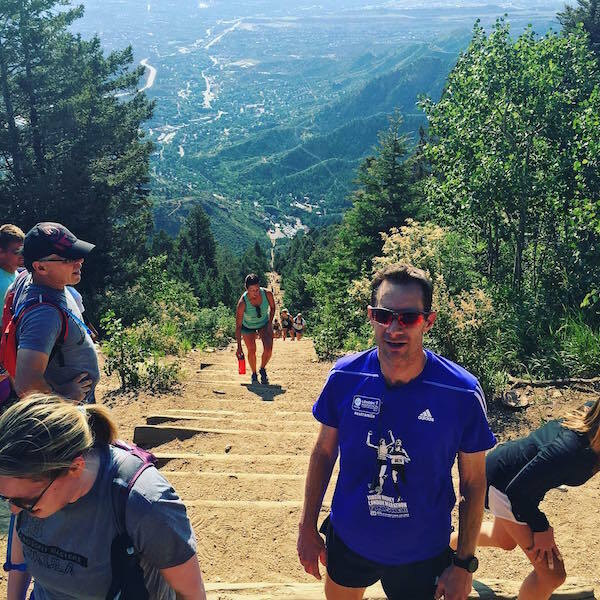 It’s unyieldingly steep—68 percent in some places—but that’s why runners and hikers from near and far have been taking the challenge for years. … and there's no way I was going to miss out on this one. I've brought up the idea of running this in the work running repo and there seems to be quite a bit of enthusiasm for it, but I wanted to make sure I got to do it at least once, just in case the 🍻, :wine_glass: and 🍸 took over and persuaded peeps against it, so I did that this morning. I ran the 14k from The Broadmoor hotel to the base of the incline and then made my way up the incline. I originally thought I'd be able to run/power walk up the incline. Oh I was sooooo wrong. This incline gets very steep very quickly and coupled with the altitude, I soon found just walking was tough and had to pause many times. It took me 40:36 from first to last step. Once at the top, I paused for a while to recover, snap a photo or two and then headed back down using the zig-zaggy Barr trail, which was way less challenging and more scenic. By the time I got to the bottom I was really really thirsty. I'd been sweating like a pig and I didn't take any water with me. I bought a bottle of water from the shoppe at the base, had a peek at the cog railway station and train and then headed back to the hotel. The run back to the hotel was a lot tougher than going out. The incline took a heck of a lot out of me and I was definitely broaching on dehydration. I ended up walking quite a few of the hills on the way back and stopped for a drink from the Fountain Creek and the stand-pipe at the Bear Creek Dog Park - you can trust humans to have free drinking water for dogs more readily available than drinking water for humans. This was a fantastic run and I'm so glad I've done the incline. You can check it out on Strava too.